ST. GEORGE — Intermountain Healthcare’s Connect Care Pro is part of a telemedicine push that uses technological advancements to bring specialized care to patients and advanced medical support to providers – a trend taking shape across the country. Connect Care Pro brings together 35 telehealth programs and more than 500 caregivers to provide access to Intermountain’s health care providers to patients wherever they are – a concept the company has pursued for more than five years, Intermountain Healthcare Vice President of Outreach Services Jim Sheets told St. George News. “We want to keep care local and increase the expertise of local physicians by providing support from our specialty clinicians,” Sheets said. Intermountain began rolling out the services, including direct-to-consumer options that provide basic medical care directly to the consumer using digital and telecommunications, according to a statement from the company. Those services include patient appointments scheduled with a doctor that take place over the computer, or an in-office visit scheduled with a primary care physician, with the benefit of having a specialist that is also present via computer or over the phone, Sheets said. Connect Care Pro also provides advanced services to physicians, including stroke evaluation, mental health counseling, intensive care and newborn critical care and is particularly valuable to rural hospitals or facilities that do not have specialized services on site. “It’s exporting clinical specialties to doctors who like working in these rural hospitals, but don’t see the complexity of patients that doctors in larger medical centers do,” Sheets said. For example, a physician at a Southern Utah hospital received a critical care consultation for an infant, which allowed him to treat the sick baby in the local hospital instead of transferring the baby to a newborn intensive care unit in Salt Lake City. Another example is a woman who walked into a hospital in Richfield in labor in her 35th week of pregnancy, Sheets said, and the treating physician had only limited experience in delivering premature babies. Instead of transferring the woman to a facility for specialty services, she was treated at the Richfield hospital by local doctors facilitated by Intermountain specialists through virtual support services. That enabled the baby’s parents to remain in the local area amid the support of their families rather than traveling hundreds of miles each time they wanted to see their child. Physicians and hospitals find significant benefit in Connect Care Pro as well, Sheets said. 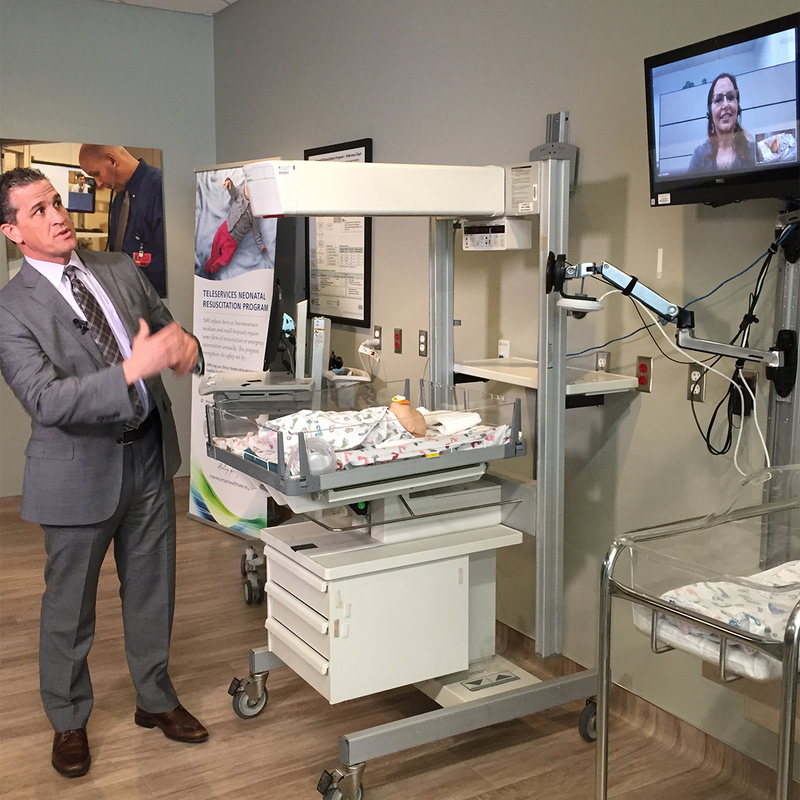 As the number of newborns transferred to other hospitals fell, Intermountain was able to lower the cost of patient care by more than $2.1 million over several years. All Intermountain Healthcare hospitals use the virtual hospital to supplement or add to their existing services, Sheets said. Additionally, nine hospitals outside the Intermountain Healthcare system have signed up for the program. Kane County Hospital, an independent rural medical facility in Kanab, is one of those. “Our partnership with Intermountain Connect Care Pro has had a huge positive impact on our community,” Chief Nursing Officer Charlene Kelly said. Intermountain Healthcare’s virtual services now offer patients a crisis evaluation in less than an hour, Kelly said, and if the crisis worker recommends in-patient treatment, the program workers assist in placing the patient. Plans are underway to extend services to communities that have underserved areas and there have been discussions to put patient kiosks or access points in various locations, including homeless shelters, schools, community centers and possibly even jails, the company said in the statement. Intermountain is joining many other hospitals around the country by increasing its efforts in the virtual hospital strategy, deploying technological advancements in hopes of providing easier and less expensive care. If anything is normal, there is a back-door in the software going straight to Tel Aviv. They have worked so hard to spy on us that we should just sign the user agreement, and don’t ask questions. We are not selling your data (fingers crossed) but we’re definitely selling you drugs.